As a fashionista who loves to wear black 95% of the time, accessories play a huge role in diversifying my looks. I have to confess my latest obsession are choker necklaces my most recent purchase was at the opening of Topshop on 5th Avenue New York City ( As seen above ). I believe accessories can dress up or down any look whether it be statement or minimalist. One of my key tips when accessorising, is to layer and stack on. Especially if you think your wardrobe is quite minimalist. For me I found instead of spending money on multiple pieces of clothing which I'd probably only where once or twice, I'd rather invest in jewellery which I could mix and match with for day and evening wear. I like to have a range of jewellery selection for each colour tone: Black, silver , rose gold and gold. I'm not a huge fan of gold so my collection is quite limited. Accessories are such an affordable fashion investment, most of my finds are from Topshop, H&M and Forever 21, prices ranging from $5-$20. 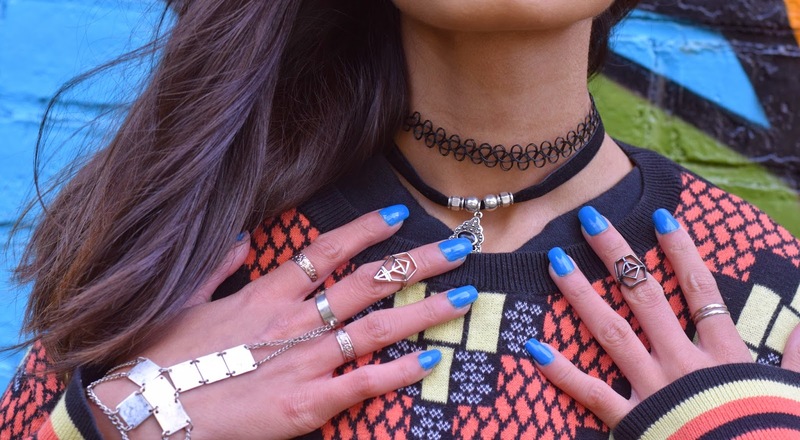 My personal favourite accessories are hand jewellery, as I am Indian I like to incorporate a bit of culture into everyday wear.